Thomas Edison was born on February 11, 1847 in Milan, Ohio. His parents were Samuel Ogden Edison, Jr. and Nancy Matthews Elliott. Thomas was their seventh child. “Wow, 7 children,” Demi quipped. Edison started school late due to childhood illness. His mind often wandered and his teacher Alexander Crawford often called him “addled”. He was kicked out of school three months after starting. “Wow, what an underestimation ?” Demi said. “You’re sure right there Mandy,” Jamie replied. “Imagine what change to history would have been made if Thomas Edison hadn’t believed in himself, and overcame failure?” Demi responded. “As the old saying goes, ‘genius is 99% perspiration and 1% inspiration’,” Jamie replied. Edison was then home-schooled by his mother, who was previously a teacher. She encouraged and taught him to read and experiment. Many of his lessons came from reading R.G. Parker’s School of natural philosophy. Edison’s life in Port Huron was bitter. He was partially deaf since a young age, and became became a telegraph operator after he saved Jimmie Mackenzie from being struck by a runaway train. Jimmie’s father, station agent J.U. Mackenzie of Mount Clemens, Michigan, was so grateful that he took Edison as an apprentice and trained him as a telegraph operator. Edison’s deafness helped him as it blocked out noises and prevented Edison from hearing the telegrapher sitting next to him. One of Edison’s mentors during those early years was a fellow telegrapher and inventor named Franklin Leonard Pope, who allowed the then broke youth to live and work in the basement of his Elizabeth, New Jersey home. On December 25, 1871, he married Mary Stilwell, and they had three children, Marion Estelle Edison, Thomas Alva Edison, Jr., and William Leslie Edison. His wife Mary died in 1884. On February 24, 1886, he married 19 year old Mina Miller. They had an additional three children, Madeleine Edison, Charles Edison (who took over the company upon his father’s death) and Theodore Edison. 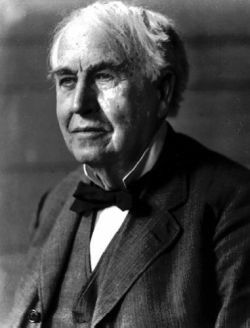 Thomas Edison died on Oct. 18th, 1931 in New Jersey at the age of 84 years.